Today I'm proud to announce that this little beer blog celebrated it's 1st year anniversary yesterday. 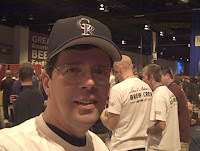 And what better way to celebrate the occasion than by attending the 2008 Great American Beer Festival in Denver last night. I volunteered to help do festival set-up and worked 3 four-hour shifts at the Colorado Convention Center yesterday and all I can say is - WOW - there is a LOT of work to be done to get this event ready for prime time. My day started early for me. I woke up around 5:30am to get ready. I live an hour north of Denver and had to hit the road by 6:15am if I was to get downtown in plenty of time to report for duty. I made a quick stop at Micky D's to buy some breakfast and headed down US 85 to Denver. Traffic wasn't bad and I found a nice parking spot just 2 blocks away from the Convention Center. I found the volunteer desk and checked in around 7:50am and entered the great hall. This is a massive place - especially when there's not 10,000 people filling the aisles. The Colorado Convention Center already had a lot of work done to it by the time our volunteer crew showed up. The booths and tables were already set up, and the CO2 gas lines and giant plastic barrels that would house the kegs were there waiting for the beer to be delivered. We had several work crew Captains there organizing the crew. We must have had over 30 volunteers there to do the set-up work. After going over some ground rules for the day, we split up into small teams and got to work. Here is how the volunteer set-up day went for me. 8:00am Gather round and get instructions from the crew Captains. I was going to work on various tasks such as moving kegs, carting ice, and moving tables. 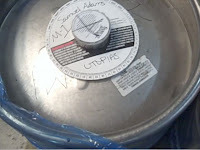 8:20-10:00am Received kegs from the fork lift crew and helped to check their labels. Split off the duplicate kegs for storage on trucks in the loading docks. Deliver kegs to the various brewery booths and put them in the plastic barrels for later icing down. Lots of heavy lifting and use of dollys to transport brew. I was working up a sweat. 10:00-10:15am Quick break time. Grabbed some water. Then I helped the folks from Alaskan Brewing to set up their booth and got to know them a bit. Talking with brewery folks can be a lot of fun! 10:15pm - 12:15pm This was now Ice Delivery time. We received crate after crate of ice bags piled high and delivered them all to each booth and applied an initial ice down to all of the kegs. There was lots of cold, heavy lifting and throwing of bags. My hands were getting numb from the wet and cold. Breaking open the bags and lifting them over and over gave me a workout. Next time I'm gonna have to get some good gloves for this. 12:15-1:00pm Lunch time! All of the people who were signed up for working a double set-up shift were given complimentary pizza and soft drinks for lunch. After working hard, a bit of nourishment sure went a long way. We sat inside one of the vendor booths to eat. 1:00-3:00pm After lunch it was time to hook up all of the kegs to the tap lines with CO2. This was a massive undertaking as there were thousands of kegs. 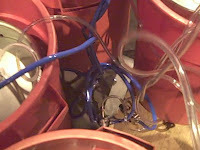 I was given a crash course in keg tapping technology and after getting squirted a couple of times I got the hang of it. There were miles of hoses and 1800 different kegs to be hooked up. Not an easy task. Many of the hose lines were tangled up and had to be straightened out. In one rare event, I saw a beer line hooked up to the CO2 line and that made a mess. We figured it all out eventually and got all of the kegs ready for pouring. Good thing too, the festival was just about 2 hours away. 3:00-4:00pm More ice. Just when I thought we were done with the moving ice, we received another round of ice crates had to ice all of the keg barrels down again. Those 1st bags melt fast apparently. Once the kegs were hooked up we had to ice them down again and fill up the barrels to the top. I noticed some of the older barrels were leaking some water. Get out the duct tape! 4:00-5:00pm Now for the final checks and troubleshooting time. We had to inspect every booth and look for problems. There were missing kegs, broken ice barrels that leaked, CO2 lines that needed fixing, more ice to be delivered, tables to be moved into place. Whew! After a bunch of quick adjustments all of the visible issues were resolved. Now everything looked ready to go. Trying to find a missing keg amongst a thousand kegs in the back was no easy task. They had a whole crew dedicated to sorting kegs back in the storage trucks. 5:00-5:30pm Once everything was ready I had to check out from set-up duty, get my free comp tickets and then race downstairs to check-in for Brew Crew (pouring) duty. I received my white volunteer T-shirt and tasting cup and marched back upstairs with an army of volunteers and reported to our sections. I was assigned to Island "C" in the Mid Atlantic region. Since I was a bit late checking in for 3rd shift I took a spot at the only brewery that wasn't already loaded with volunteers. 5:30pm-10:00pm Pour beer! 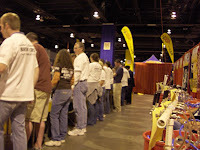 The sound of bagpipes filled the air signaling the start of the 2008 GABF. The crowd poured into the hall and the festival began. I was working at the Allentown / Bethlehem Brew Works booth (C14). They had 5 different brews including an amazing Pumpkin Ale, an outrageous Blueberry Belch wheat beer and a delicious sour Belgian Raspberry Lambic called Framboise. This was the first brewery as you entered the aisle and it got a lot of traffic. I was kept busy for a very long time. I can tell you that after working for 14 hours that I was dog tired. My muscles hurt from all that lifting of kegs, ice and moving tables and standing on my feet all day. But, overall I was very pleased with how well organized the whole event was and how smoothly things went. I have a great respect now for all of the planning and preparation the GABF organizers had done. Wow - this was a BIG effort and it all turned out great. The crowd behaved themselves (for the most part) and even the drunks weren't too obnoxious. I was able to get out of the building shortly after 10pm and get back home within an hour and a half. I managed to take a lot of video during the day and hope to put together a short report on all that sometime in the next week. I'm planning to return to Denver later this weekend to actually do some tasting sessions! I only managed to try about 8 beers last night (1oz each) while volunteering but that's OK. I needed to stay sober and alert to handle the non-stop pouring of beers. I'll get more beer next time. 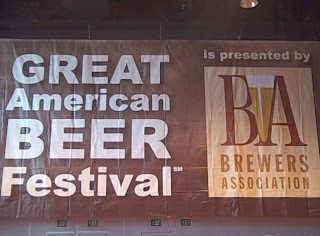 Being a volunteer at the Great American Beer Festival was a wonderful experience and I highly recommend it to anyone who has an interest in helping out. Plus, it's a great way to earn a free ticket too! But word of warning, get lots of rest before you do - you're gonna get tired. I did manage to see several people I recognized last night and hope to spend more time with them later this weekend. It was a wonderful way to celebrate the 1 year anniversary of Fermentedly Challenged. Thanks to everyone who come and read this blog. It's been great getting to know a lot of people through the Internet and in person during this last year. Over 200 posts, over 200 different beers sampled and 4 brewfests during the last year kept me very busy. I hope the next year is just as fun. 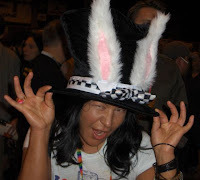 Continue on with: Behind the scenes video 2008 GABF. 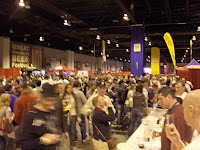 - Hot picks from the 2009 GABF (tasting notes).